Creativity is different for everyone. We can say it is a subjective matter. What Creativity is for a writer is not for a musician, what for a choreographer is not for a painter, what for a graphic designer is not for a fashion designer and so on. But the source of creativity is always the same. It cannot be defined in words. The tips discussed in this article are completely new. You won’t find them anywhere on the internet. These tips are so fresh that some of them might sound strange or weird to you. In this article, you wouldn’t find tips like go for a walk, travel to a new place or anything like that. Yes, they do work but possibilities are much that you have already done that and you still haven’t had any new and unique idea for your next creative project. 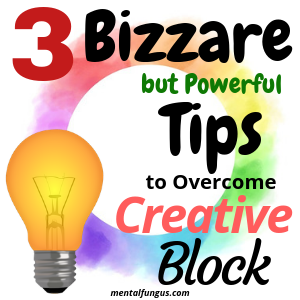 So I am trying to help you and giving you some new tips to overcome that creative block which is troubling you for a while. As I already told you these tips might sound or should I say will definitely sound “worthless” but believe me these tips are worth trying because it gave me results and would definitely give you too. 1. Try listening to the songs of different genres one after another. For example. One rock song than a romantic one then a sad song. And at the same time try to find new ideas while listening to these songs. I am unable to provide a perfect explanation for why it works but it works. By doing this your mind will move from one mood to another. Eventually, this will start the traffic of new ideas. 2. Relaxing your mind is the best way to come up with ideas. For this, we watch a movie or television. But I advise you to try the same but in a different way. Just do one simple thing. Watch TV on mute mode. So that you only see what’s happening rather than listening what they are saying. This way your mind will automatically start guessing what is happening on the screen or starts filling missing information coming from the screen. This will push your mind’s creative button. 3. Engage your mind with two Stimulus Simultaneous. For example, call someone on the phone with whom you can talk to for a long time and as you are talking to this person just play FreeCell or any other brainy puzzle game on my mobile. This way your mind has to interact with both game and respond to the person on call too. This works perfectly well for me. Here, one thing you should note down that these tips are basically advising you to change the way you do very normal and basic things. Remember, these tips are not a sure shot way to get ideas falling onto you. But, Yes it will surely help you to adopt some new ways of thinking and generating ideas. Just give it a shot for once but without too much expectation from it. What is your take on these Tips?